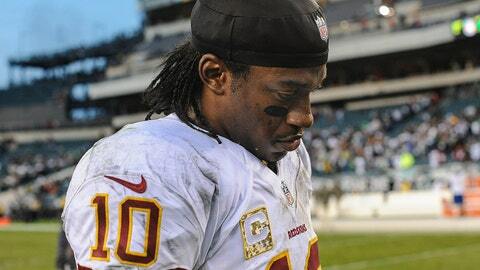 The father benched Robert Griffin III. The son would rather have him on the field. Washington Redskins offensive coordinator Kyle Shanahan said Thursday he wasn’t consulted on coach Mike Shanahan’s decision to sit Griffin, adding that he finds it "a little disappointing" that the franchise quarterback won’t be playing for the rest of the season. "If it was about really football, I think you would talk to the offensive coordinator," Kyle Shanahan said. "But the decision doesn’t have to do with football, it has to do with the future of an organization. That’s out of my realm." Kyle Shanahan said he made out two game plans this week for at Atlanta while waiting for Mike Shanahan to announce that Kirk Cousins will start the final three weeks. Mike Shanahan, after consulting with owner Dan Snyder and general manager Bruce Allen, said he decided to shut down Griffin because of the pounding the quarterback has taken in recent weeks and that it’s better for the franchise to have Griffin healthy for the offseason rather than get injured. "I’m a coordinator. I don’t look at things the same way an owner does or a GM or a head coach," Kyle Shanahan said. "I don’t look at the future of the franchise, I look at how the hell am I going to win on Sunday, and I would love to have our starting quarterback out there for the rest of the year. It is a little disappointing to me that we can’t finish this, but I do understand their decision." Mike Shanahan is on the coaching hot seat, and Kyle Shanahan said the accompanying drama is harder to take because of the father-son relationship. "I’d be lying to you if I said it was the same as any other situation," Kyle Shanahan said. "If we were going through turmoil in Houston or anything like that, or Tampa Bay, I definitely didn’t feel it as much as I do here. I think that’s pretty obvious to anybody, but I’ve learned how to deal with it better. It’s something I do have to separate myself from, no matter how much people want to involve me. "I do get when people talk about the Redskins, they always put an ‘s’ on the last name of the ‘Shanahans,’ but I can’t help that." Kyle Shanahan admitted his father’s success with the Denver Broncos painted a rosier-than-reality picture of the NFL coaching life. "I don’t remember growing up him being a part of a 3-13 season," Kyle Shanahan said. "I had a little bit of a make-believe childhood, growing up with a coach. ‘This is awesome, if you get into coaching, you win every year, you get to go to Super Bowls, you have maybe one losing season which is 7-9 in 15 years, and if that’s as hard as it gets, this stuff is going to be easy.’ I don’t know if I’m wiser now, but I understand the reality that coaching is tough. But I can handle it." At times, Kyle Shanahan sounded as if he were pitching himself for his next job, given that he could be on the market in a few weeks. "I think I’ve done some pretty good things statistically, and I know statistics aren’t everything, but they do say a lot and I think you can put my statistics with anybody’s and I feel pretty good about that," Kyle Shanahan said. "Yeah, I would love it if all you guys focused on that instead of my last name, but I understand that it’s not your guys’ job either. But the main thing is that coaches and GMs who hire people, they want to win football games."